Organizing for Collective Action investigates the political and economic behaviors of national associations, including trade associations, professional societies, labor unions, and public interest groups. It focuses upon the ways that these organizations acquire resources and allocate them to various collective actions, particularly for member services, public relations, and political action. 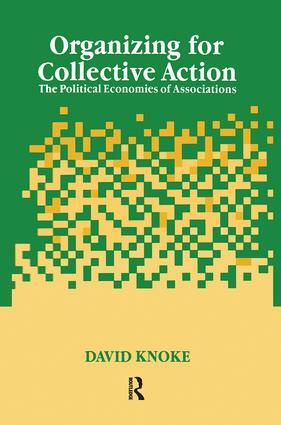 This analysis is structured around three broad theoretical paradigms for collective action: (1) the problem of societal integration which concerns the ways that people are tied to organizations and the ways that organizations connect their members with the larger society; (2) the problem of organizational governance which considers how individuals become unified collectivities capable of acting in a coordinated manner, and (3) the problem of public policy influence which involves interactions among public and private interest groups to formulate the binding decisions under which we all must live.